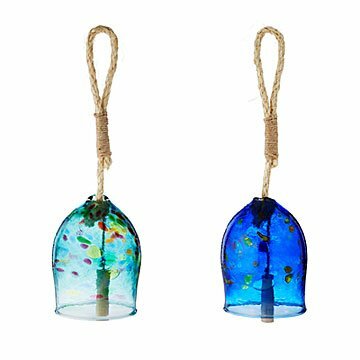 Hang this recycled glass bell in your yard or garden and fill the air with a dulcet melody. Make your garden even more enchanting by filling the air with the melody of this luminous work of art. Stephen Kitras forms molten recycled glass into a large bell decorated with flecks of color. As the wind blows, the wooden clapper gently strikes the glass, ringing out with a deep, resonant chime. Suspend the sisal rope handle from your porch or a post in your yard to bring a lulling background music to a laid-back afternoon or alfresco fete. Handmade in Canada. Given as gift in memory of mother who passed away from Ovarian cancer. Would love to own a yard full! Gave to my BEST friend for her birthday. She loves it! I bought this for my mom for Christmas. As I had to mail it to PA, I did not remove it from the box but when she opened it on Christmas morning, it was exactly as advertised. I got the darker blue one and the color was really beautiful, like the picture. My mom really loved it.